A market town and fishing port on the east coast, Monimaskit has been a burgh since 1403. It has associations with William Wallace, who as a boy, according to legend, killed three English soldiers there after disputing with them the ownership of a bannock; and with Sir James ‘the Black’ Douglas, who destroyed the now vanished castle and its English garrison in 1311. In the 16th, 17th and 18th centuries Monimaskit’s modest prosperity was based on the export of wool, skins and fish to the continent, and it was also a market for the surrounding fertile land, particularly after widespread drainage and other agricultural improvements carried out by Sir William Guthrie of Keldo in the 18th century. The North Sea herring boom caused the town to expand rapidly in the early 19th century and it was subsequently a centre for fish-curing and -processing, although today the fishing industry has all but disappeared, and only a few small vessels operate from the harbour. New industry related to North Sea oil, tourism and food-processing are important sources of employment in the area. The town has a secondary school which also serves the surrounding villages, and two primary schools. Historic buildings of note in or near the town include Monimaskit Old Kirk (CoS) dating from 1565, Keldo House (16th century, largely reconstructed and enlarged in the 1760s), the Corn Exchange (1860, now the town museum) and the Municipal Buildings (1876). The area is rich in ancient monuments, including souterrains, hill forts, cup-and-ring marked rocks and, most notably, twelve standing stones, all of which are within a five-mile radius of the town. Augustus Menteith, the folklorist and mountaineer, was born in Monimaskit in 1853 and after studying at Aberdeen was minister at Myreside before translating to Monimaskit Old Kirk in 1883. He wrote the definitive History of the Parish of Monimaskit, published in 1887, and Relicts and Reminiscences of Old Monimaskit (1892). He died in a climbing accident in the Alps in 1895. Four miles west of the town the Keldo Water flows through an impressive geological formation known as the Black Jaws, a narrow chasm with cliffs some one hundred and fifty feet in height. This peculiar picture was found among Gideon Mack's papers after his disappearance. 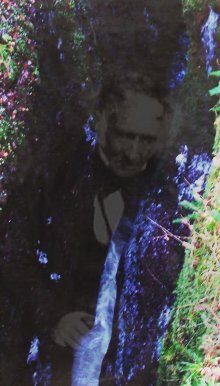 Although the photograph appears to have been taken on a normal camera and was, on the evidence of the envelope which contained it, developed at Boots the chemist in Monimaskit, this strange double-exposure of a modern picture of the Black Jaws, and a Victorian image of an unknown minister, would seem to require advanced knowledge of photographic techniques.